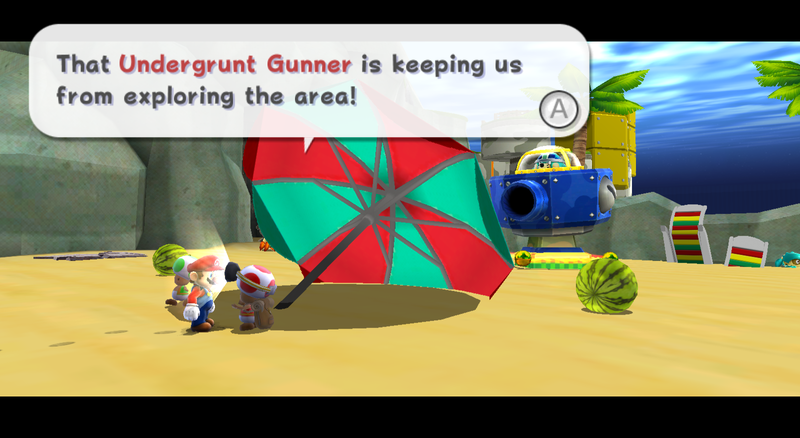 Undergrunt Gunners appear as bosses in Super Mario Galaxy and enemies in Super Mario Galaxy 2. They are cyan Undergrunts that use cannons to attack, likely in reference to the Monty Moles in Super Mario Sunshine or Monty Tank from New Super Mario Bros.
Undergrunt Gunners appear in Super Mario Galaxy as bosses. They appear in three galaxies and in each galaxy they must be hit three times on the cockpit to be destroyed. The second time they get hit, they get angry just like Major Burrows. In the Gold Leaf Galaxy, the Undergrunt Gunner is at the very end of the level "When it Rains, it Pours" in a pit full of spikes and one raincloud. To get up there, the player must have used a Bee Mushroom to transform into Bee Mario. This time there is only one way to defeat it, ground pounding the cockpit, but there are two ways to go about doing that. The first way is to use Bee Mario's power of flight to rise above the cockpit and ground pound there but that can be difficult because there is a thundercloud and the gunner is shooting water. The second way takes longer, but the water is no longer a worry, regular Mario must go across the pit of spikes using moving platforms and then ground pound a switch to raise a staircase. He must then race to the staircase, climb up and ground pound the gunner. After this gunner is defeated, it releases a star. The Undergrunt Gunner in the Toy Time Galaxy is much different from those in the other levels in that it shoots electricity instead of water. His shots also try to home in on Mario. The electricity can hurt Mario as he tries to defeat the gunner. This gunner is at the end of the Toy Time Galaxy's level "Bouncing Down Cake Lane" on the top of a large pole in the middle of a cake. Off to the side of the cake there is a Spring Mushroom that is to be used to defeat the gunner. Mario must grab the Spring Mushroom and turn into Spring Mario with it and then use the spring's high jump to jump up on top of the gunner where he must ground pound it. If Mario gets hit by the electricity at any time, he will lose a health and the Spring Mushroom. Another thing that is different about this gunner that is not in the other gunners is that after the second hit, it does not only get angry as the other gunners do. It also puts up an electric shield that goes on and off zapping Mario if he is so unlucky as to be on top of the gunner as its shield turns on. If this gunner is defeated, it releases a Power Star. Mario also needs to bounce in the right place or he will bounce off the Undergrunt Gunner without causing any damage. It is also possible to defeat this Undergrunt Gunner without using the Spring Mushroom, via a Backwards Somersault off of either of the nearby Fire Pressures, followed by a Wall Jump and a spin. 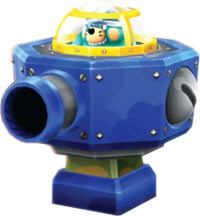 In the Deep Dark Galaxy, the Undergrunt Gunner appears in the level "Bubble Blastoff" at the very start on the beach on top of the cannon leading to the Wooden Planet. The gunner is mostly harmless as it shoots water balls at Mario which will just blast him back on the beach. There are three ways to beat it here. The first one is the regular way; Ground Pound the top of its machine. The second is to Star Spin the Coconuts all over the ground into the machine. And finally, the third way is to grab a Koopa Shell from underwater, and fire it into any part of the machine. The cannon is under this gunner so it must be defeated to traverse to the Wooden Planet and then to beat the level. This Undergrunt Gunner does not leave behind a star. Undergrunt Gunners return as basic enemies in Super Mario Galaxy 2. They first appear in Bowser Jr.'s Fearsome Fleet, where they use Bullet Bill cannons resembling smaller, red-colored Koopa Clown Cars to attack. However, the player can use Yoshi to send the Bullet Bills back at the Undergrunt Gunner. In the overview of Bowser Jr.'s Fearsome Fleet, which can be seen at the top of the screen while hovering over the galaxy with Starship Mario, it shows an Undergrunt Gunner firing a cannonball, which they do not do in the actual stage. Some Undergrunt Gunners also fire cannonballs instead of Bullet Bills. They also appear in the Fleet Glide Galaxy as enemies trying to shoot Fluzzard. The theme music when fighting them is usually the same as when fighting Major Burrows, except on Deep Dark Galaxy where Baron Brrr's theme music is used instead. The Undergrunt Gunner is the only boss whose name is not mentioned in the mission titles (in Gold Leaf Galaxy, the bees call it a mole, and in Toy Time Galaxy, the boss is never mentioned), instead having it mentioned by Captain Toad in the Deep Dark Galaxy. The Prima official game guide refers to the machine in the Gold Leaf Galaxy as a "bubble cannon", and the one in Toy Time Galaxy as a "cannon". ↑ Browne, Catherine. Super Mario Galaxy 2 PRIMA Official Game Guide, page 30. ↑ 3.0 3.1 Shogakukan. 2015. Super Mario Bros. Hyakka: Nintendo Kōshiki Guidebook, Super Mario Galaxy section, page 126. ↑ Black, Fletcher. Super Mario Galaxy PRIMA Official Game Guide, pg. 222. ↑ Black, Fletcher. Super Mario Galaxy PRIMA Official Game Guide, pg. 245. This page was last edited on April 20, 2019, at 14:06.